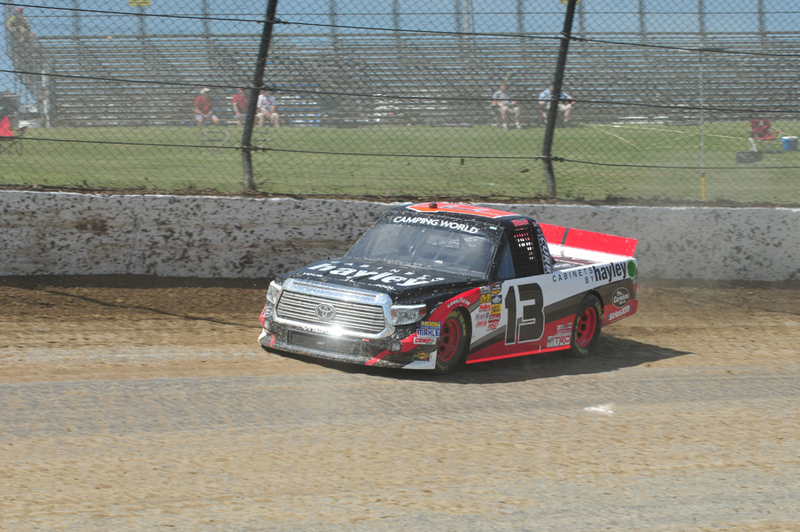 Rossburg, OH (July 23, 2015) - There have been many "firsts" in Cameron Hayley's rookie season in the NASCAR Camping World Truck Series (NCWTS), and Wednesday night's 1-800-Car-Cash Mud Summer Classic at Eldora Speedway was no different. Hayley, a 2015 Sunoco Rookie of the Year contender, started ninth and finished eighth in his first Truck Series start on dirt at the famed half-mile, clay oval. Making his first laps around the "Big E" in NCWTS practice on Wednesday morning, Hayley posted the 17th and 12th-fastest times, respectively, in both sessions. The ThorSport Racing driver also qualified fourth, and finished second to race winner Christopher Bell in the fourth qualifying race of the night, lining the No. 13 Cabinets by Hayley Toyota Tundra up in the ninth position for the three-segment (60-50-40 laps), feature event. While the 154-lap event was slowed by a record number of caution flags (13 for 61 laps), Hayley's No. 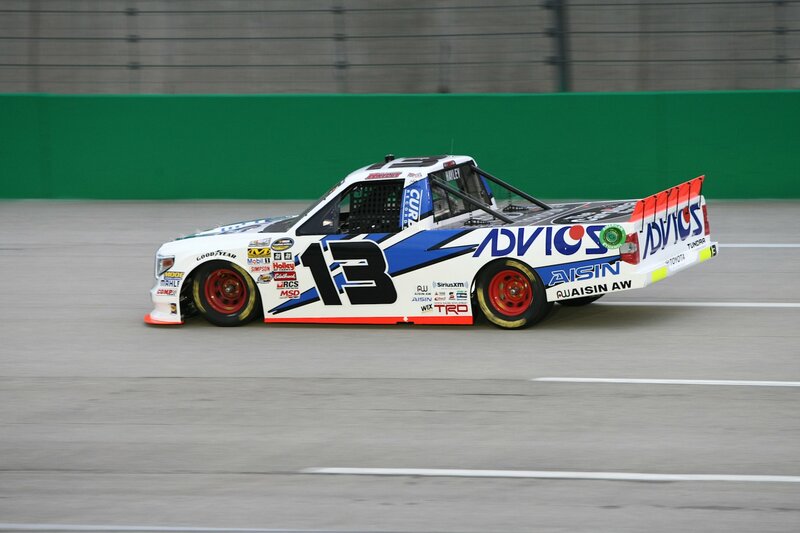 13 Toyota Tundra stayed pointed in the right direction during the action packed race. Running as high as sixth and as low as 14th, Hayley maintained an Average Running Position of 10.0. With track position at a premium, Jeff Hensley brought his Sunoco Racing Rookie to pit road once under the first competition caution at lap 55, for four tires and fuel. When racing resumed on lap 60, the No. 13 Toyota Tundra was scored 11th. In the final 90 laps, the ThorSport Racing driver would battle the tightly bunched field, changing track conditions, and a Toyota Tundra that was loosing grip. Hayley would fall as far back as 13th in the running order just past the half-way mark in the event, but rallied in the closing laps, which included a green-white-checker finish, to finish eighth behind race winner, Christopher Bell. Following a solid top-10 finish at Eldora Speedway, Hayley gained one position in the NCWTS driver point standings and now sits sixth, 101 markers behind teammate and point leader, Matt Crafton. "We accomplished our goal (of a top-10 finish). I felt like we were in a really good position, sitting eighth, the caution before the last one. I think we would have been in position to make a better run at the end. I found a little more grip about three-quarters of the way up the track, but it was just so up and down (on the leaderboard). We were up to eighth, and then back to 13th, just up, and down, up, and down. I was just so happy to get everyone at ThorSport Racing a good solid top-10 run tonight." Sandusky, Ohio (July 20, 2015)-Cameron Hayley, driver of the No. 13 Cabinets by Hayley Toyota Tundra, will make his ninth track debut of the 2015 NASCAR Camping World Truck Series (NCWTS) season in Wednesday night's 1-800-CarCash Mudsummer Classic at Eldora Speedway in Rossburg, Ohio. Not only will the Sunoco Racing Rookie of the Year contender be making his debut at the historic, half-mile, high banked clay oval, Hayley will also be making his dirt debut in the unique three-segment, 150-lap event at the Tony Stewart-owned track. Triad Trailblazer...If Cameron Hayley or another Triad Racing Technologies-backed team can win on Wednesday night at Eldora Speedway, it will be the 100th win for the Toyota Racing engine supplier. Previous Race Recap...Hayley started 12th in the UNOH 225 at Kentucky Speedway when qualifying was cancelled due to weather and the field was set based on the rule book - the 2015 NCWTS owner point standings. In his track debut, with no on-track experience before the green flag, Hayley ran as high as seventh and finished ninth. Sparta, Ky. (July 10, 2015) - Rain showers halted all on-track activity throughout the day at Kentucky Speedway in Sparta on Thursday, as 18-year-old Sunoco Rookie of the Year candidate Cameron Hayley got set to make his debut at the 1.5-mile facility. With a lack of practice, the drop of the green flag marked Hayley's first laps on the track in his young NASCAR Camping World Truck Series (NCWTS) career. Due to showers throughout the afternoon, the field was set by the rulebook, placing the No. 13 ADVICS Toyota Tundra in the 12th position on the starting grid. As the race began, Hayley quickly settled into the 12th position, looking to gain valuable on-track experience. The competition caution on lap 22 allowed Hayley to bring the No. 13 Toyota Tundra down pit road for adjustments. Hayley notified crew chief Jeff Hensley that the truck was "chattering through the corners." Hensley called for big adjustments to help aid his rookie driver, including a track bar adjustment, rubbers out of the right rear, four tires and fuel. Following the first pit stop on lap 22, Hayley restarted in the 18th position and quickly went to work on the competitors in front of him. By lap 40, Hayley was back up to the 12th position and looking for more. A caution on lap 45 allowed the crew to tend to the 18-year-old's Toyota Tundra with four tires, fuel and a wedge adjustment. When the race resumed, Hayley was scored18th and looking to make up ground. A long green-flag run allowed Hayley to work his way up to the top-15 before having to hit pit road himself on lap 98 for four tires and fuel, and just five laps later the fourth caution flag was displayed for debris. Hensley elected to gain his young driver track position by leaving him on the track to save fuel. When the race resumed on lap 107, Hayley quickly jumped up into the top 10, moving as high as the seventh position on the racetrack. Surviving a rash of late-race cautions, the Canadian driver was able to make a strong charge in the closing laps. However, due to a late race caution on lap 145, the UNOH 225 was cut short, relinquishing Hayley to a ninth-place finishing position in his NCWTS Kentucky Speedway debut. "Our ADVICS Tundra was really good today. I'm really happy to have ADVICS on board and give them a good solid top-10 run. We just really needed some track position. We weren't where we needed to be at the start of the race, because we didn't have practice today, but the guys worked so hard throughout the race to get that truck freed up and get it better for me. My spotter, Eddie D'Hondt, helped me a ton out there in the spotters stand with my lane and my line, and I think it will help me a ton with the rest of the mile-and-a-half racetracks coming up." Sandusky, Ohio (June 16, 2015) - Entering the ninth race of the season at Iowa Speedway in Newton, Cameron Hayley, driver of the No. 13 Cabinets by Hayley Toyota Tundra, hopes to continue building momentum in 2015. Making seven track debuts in the season's first eight races, the Sunoco Rookie of the Year contender has scored two top-five and three top-10 finishes. The ThorSport Racing driver scored just his second career NASCAR Camping World Truck Series (NCWTS) top-five finish in last Saturday's Drivin' for Linemen 200 at Gateway (Ill.) Motorsports Park. With track experience on his side this weekend, Hayley returns to the site of Friday night's American Ethanol 200 presented by Enogen at Iowa Speedway with a cornfield full of reasons why he could see success at the Midwestern track. Chassis Chatter... The No. 13 ThorSport Racing team will unload chassis No. 36 for Friday night's American Ethanol 200 at Iowa Speedway. This is a new chassis for Hayley, and will make its 2015 debut this weekend. Rookie Race... Hayley remains second in the 2015 Sunoco Rookie of the Year battle after eight races this season. The ThorSport Racing driver now trails leader Erik Jones by 28 points. Previous Race Recap... Running within the top-15 for the majority of his Gateway Motorsports Park debut, pit strategy and a couple late race cautions put Hayley within striking distance of the leaders in the final laps. Taking advantage of the track position, and a fast Toyota Tundra, the Sunoco Rookie of the Year contender battled his way to a top-five finish on Saturday night, the second of his young NCWTS career. Madison, Ill. (June 14, 2015) - With rain showers pushing back the start time of Saturday's Drivin' for Lineman 200 at Gateway Motorsports Park, Sunoco Rookie of the Year contender, Cameron Hayley, overcame adversity to snag his second top-five finish of the 2015 NASCAR Camping World Truck Series (NCWTS) season, tying his career-best finish of fifth at Kansas Speedway in Kansas City earlier this year. 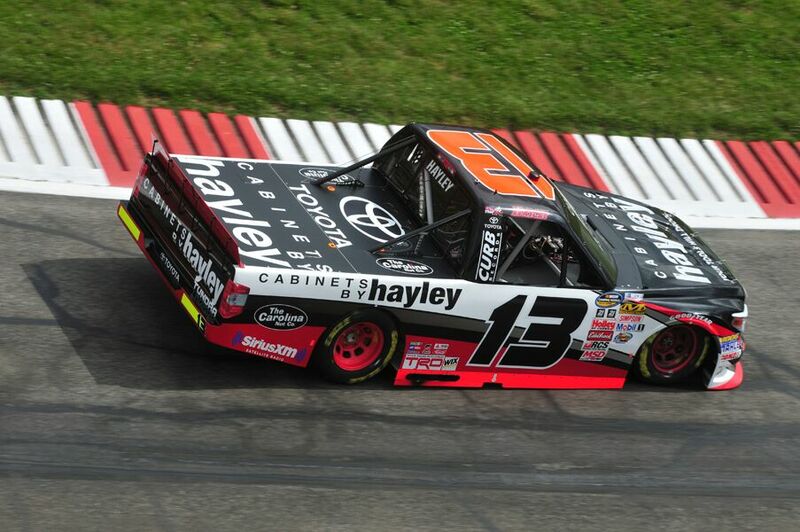 Trying to overcome a "tight" Toyota Tundra throughout the entire 160-lap race, the 18-year-old Canadian driver still found himself running comparable lap times to the leaders. Running as high as fourth and as low as 15th, Hayley maintained an Average Running Position of 9.4 during the event. Bringing his No. 13 Cabinets by Hayley Toyota Tundra to pit road during the first caution of the night at lap 54, and again on lap 81, crew chief Jeff Hensley called for four tires, fuel and adjustments to try and improve the handling. Trying to maintain track position, Hayley didn't return to pit road again until the caution flag waved on lap 118. However, upon exiting pit road, the Sunoco Rookie of the Year contender sustained left front nose damage from a competitor and was forced to return to pit road once again for repairs. Mired deep within the top-15, Hayley inched his way closer and closer to the top of the leaderboard despite the dwindling number of laps remaining. Fortunately, for the Sunoco Racing rookie, a couple late-race cautions slowed the pace of the field and allowed Hayley to work his way up into the mix and duke it out with the leaders. The ThorSport Racing driver would cross the stripe in the fifth position behind race winner, Cole Custer. Taking advantage of track position to earn his second top-5 finish of his young career, the Canadian driver maintained the sixth position in the NCWTS driver point standings, but cut the deficit to 75 points behind ThorSport Racing teammate and point leader, Matt Crafton. "We got it done tonight. It was an up and down night to say the least for our Cabinets by Hayley Toyota Tundra team. We struggled really badly at the beginning. We just missed it by a lot, but we got better throughout the race. I definitely gave it my all. On all those restarts, we gained a ton of positions at the end, when things got a little dicey. I don't know how I weaseled through there, but I did. Tonight was a great effort by all my guys."